With homemade Nutella buttercream frosting! This year for Victor‘s birthday I wanted to make something extra special. I have made Jello Poke Cake in the past but wanted to trying something that would be easier to serve to a dozen friends out for a birthday brunch in the neighborhood. These vanilla cupcakes are special because they have stripes of strawberry rum jello inside. They are topped with an icing made with a blend of butter, sugar, and everyone’s favorite Nutella (an entire jar!). These were a sell-out hit at Victor’s brunch, everyone had two. Happy Birthday Victor! Prepare cake batter and bake as directed for cupcakes. Allow to cool to room temperature or colder. 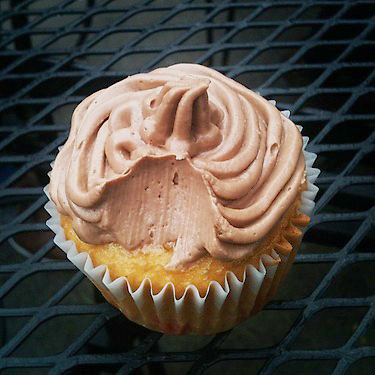 Poke holes in the tops of the cupcakes with a fork or chopstick. Stir boiling water into dry gelatin mix until dissolved. Stir in rum and refrigerate until cooled to room temperature or colder. Use a big medicine dropper or a pointy tipped squeezy bottle to squirt liquid jello into each of the holes. Refrigerate while you make the icing. In a large bowl with a mixer beat together the butter and powdered sugar on low until well-blended. Add the Nutella, vanilla extract, and salt and beat for two minutes. Add the whipping cream and beat for about one minute, until the frosting lightens slightly in both color and texture. you’re amazing!!!! thank you!! so creative..